Global 100% Renewable Energy Platform launched! Today, representatives from major organizations from all over the world have gathered in Bonn to launch The Global 100% Renewable Energy Platform. 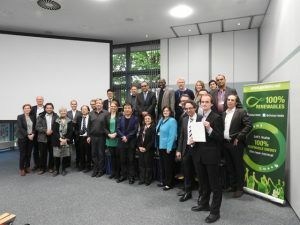 During the launch event, some of the world’s most renowned experts on renewable energy presented solutions and strategies for achieving Global 100% Renewable Energy, in line with the world’s climate change mitigation needs and to provide access to modern energy services to all human beings. Held in parallel with the UN Bonn Climate Change Talks, the event has, once again, confirmed the value of having a true multi-stakeholder platform connecting stakeholders from civil society, business, government and science in order to jointly make global 100% renewable energy a reality in the interest of mitigating the effects of climate change. Bill McKibben, Platform Ambassador and Co-Founder of 350.org: “Everybody knows that we will get to using renewable energy sources simply because they are free, but we have to get there so very fast if we have any hope of catching up with the effects of climate change”. The Platform’s work will be guided by its principles that all new investments into energy systems have to be 100% renewable energy based, and that decentralized and people-centered approaches are the best and fastest way to transform societies. This is also the reflected in the policy tool that members of the platform launched today in Bonn: The “100% RE Building Blocks“. It addresses legislators, government officials, and community champions who are motivated to bring the 100% RE vision forward within their communities and unveils that transitioning towards 100% RE requires systematic change beyond energy technologies. Naoto Kan, Platform Ambassador and Former Prime Minister of Japan: “Renewables contribute to world peace because conflicts over resources can be avoided if countries can produce their own electricity sustainably”. Founding members underlined during the launch today that the Global 100% Renewable Energy Platform is going to vigourously pursue these ambitions.